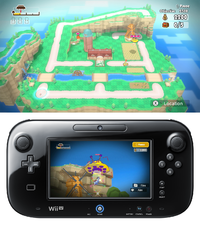 Taxi is Dribble and Spitz's minigame in the Wii U game, Game & Wario. It is a single-player game. Dribble and Spitz are driving their taxi through Route 56, starting to fall asleep. Not long after, they encounter a hitchhiker waiting on the side of the road. A UFO suddenly appears overhead and abducts the person. Spitz then grabs a laser gun, opens the top of their taxi, and attempts to shoot at the UFO. He then tells Dribble to follow it and he cooperates, following the UFO over a hill leading to a farm. A general view of the game. Taxi is played by moving around in Dribble and Spitz's taxi and firing with Spitz's laser bazooka. The is used for a first-person view of the game, including aiming with the gun, while the television screen is a bird's-eye view of the entire map. The player's goal is to accumulate a target amount of money, with the extra "Taxi King" objective (6000) offering a higher challenge in which completing for the first time rewards a Cluck-A-Pop coin. To earn money, the primary objective of the game is to shoot down UFOs to release abducted clients, then give them a ride to a shelter. There are three types of UFOs: red (one hit point), blue (two hit points) and yellow (three hit points). Each kind of client pays the player a different amount of money when delivered to the shelter. Only three clients can fit in the taxi at a time. A Fronk occasionally flies overhead with a balloon; it can be picked up as well. After the first 150 seconds, the mothership arrives at the area and initiates an attack. The player is given five hit points and three minutes to take down the mothership by firing at its weak spots, dodging its own laser beam attacks in the meantime. Ten stars rain down to the ground as the mothership is destroyed, which the player must try to collect before the remaining time is over. Additionally, five treasure chests are hidden inside elements around the map. The player must fire at these spots or lure the mothership to attack them to reveal them. The introductory level is a simple, grassy plain. The main features of the setting are a road that leads to the top of a cliff, a river and a windmill. The shelter is a barn, and the clients are the farmer's animals: chickens, pigs and cows. Treasure chests may be found in trees, bells or the water wheel. The first mothership fought has four weak spots, each of which must be hit three times to be destroyed. Lastly, the player must shoot the mothership's exposed core five times. Coaster City is an urban landscape with three levels. Both the second and third levels consist of two separate platforms. Two elevators connect the first level to each of the highest platforms, while coasters connect each platform in the second level to the one above it; a third coaster links the two parts of the third level. The shelter is the central building on ground level, and the clients are kids, adults and "moneybags." The mothership has twenty one hit point weak spots. Lastly, the player must shoot the mothership's exposed core five times. Description: "This three-story roller coaster-connected city is straight out of the future! UFOs are barely even out of place here, but they still mean trouble. Our taxi can ride the elevators and coasters too. It's a cabbie's dreamland!" The Giant Bedroom is the last level in the minigame. The geography of this course is formed by huge boxes and books, as well as a bookshelf in the back and a giant boy laying down on the ground. The shelter is a cookie box in the middle of the room, and the clients are ants, ladybugs and beetles. Treasure chests may hide in coins and figurines. The final mothership has nine targets, each of which must be shot three times. Lastly, the player must shoot the mothership's exposed core five times. Description:"What a cluttered room... Hey! There's a huge guy in here! And UFOs, of course. But who even needs a lift in a place like this?" "Swerve, steer... and shoot UFOs?! Eh, just another day of life for us cabbies Dribble and Spitz!" This page was last edited on October 18, 2018, at 20:16.